These days, when rebates are available left and right for water/energy conservation upgrades in your home, everyone is looking for ways to upgrade and save! Here are a few simple ideas for conserving water in your home! 1. Take shorter showers. A five minute shower consumes up to 25 gallons of water. Imagine how much water your leisurely 10-15 minute shower would consume! Cutting back on shower time can shave off gallons of wasted water and extra expenses. 2. Install a low-flow showerhead. Low-flow showerheads use about 2.5 gallons of water per minute, compared to a typical showerhead which uses about 6 gallons per minute. Consider your five minute shower. This would be a difference of 17.5 gallons per minute! 3. Change all faucets to water conservation options. 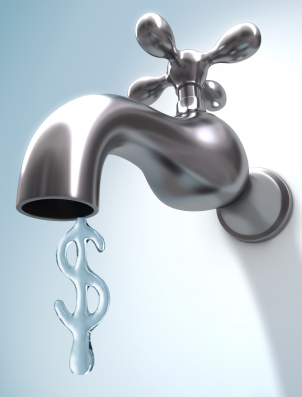 Investing in low-flow faucets can save you up to 500 gallons of water each year and you'll barely notice a difference in your water flow or pressure. 4. Use the dishwasher. While hand-washing dishes may seem more efficient, running an energy-efficient dishwasher can use less water than washing dishes by hand. You'll save water, energy and can skip the dishpan hands. 5. Switch to an energy-efficient washing machine. These appliances can use better than 50 percent less water than others and save money on water consumption. 6. Replace toilets with low-flow models. Using an outdated toilet just helps you flush money down the toilet each day. Lower-flow toilets get the job done and can save a family of four about 16,000 gallons of water each year. 7. Check for water leaks. Drips in and around the house add up to wasted water and money. Make sure to call GreenTeam right away at the first sign of trouble!